Lynnwood, WA : Emerald Books ; [Seattle, WA] : Distributed by YWAM Pub., c2001. 219 p. : map ; 21 cm. A narrative biography of America&apos;s sixteenth president, focusing on his impact on history and on the qualities of his character as a self-taught lawyer with a sharp mind and a passion for justice. 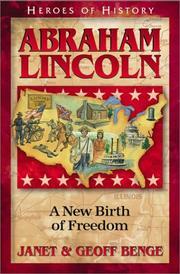 Abraham Lincoln : a new birth of freedom / Janet & Geoff Benge. 504 BibliogEtcNote $a Bibliography, etc. note Includes bibliographical references (p. 219). 520 Summary Etc. $a Summary, etc. note A narrative biography of America&apos;s sixteenth president, focusing on his impact on history and on the qualities of his character as a self-taught lawyer with a sharp mind and a passion for justice. 650 Subj:Topic 1 $a Source other than LC Presidents.